As a sort of creative foil to her former employer, Lisa Hannigan’s vocals served as a delicate yet confident counterpoint to the folk wailings of Damien Rice, and in turn she launched a somewhat prolific career as a guest vocalist for the likes of The Frames and Herbie Hancock. 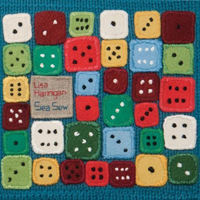 In her first proper turn as a solo artist, however, Hannigan’s Sea Sew album reveals how her work as a co-conspirator merely scratched the surface of her true capabilities. A collection of ten songs best described as “assertive folk,” Hannigan’s brand of simple yet smart pop thankfully avoids many of the trappings of traditionally Irish folk-pop – quarter-octave vocal leaps a la Andrea Corr, clipped vowel sounds a la Sinead Lohan – and instead focuses on tiny crescendos and a sort of cool not normally found in such violin- and light guitar-based tunes. If anything, Hannigan has more in common musically with islandmate Van Morrison’s early jazz-rock fusion than the expected cabal of Celtic-sounding folkies. Able to shift moods on a dime, Sea Sew effortlessly glides between its sonic and emotional highs and lows. Be it the thoughtful melancholy of “Splishy Splashy” barreling straight into the sunny love note of “I Don’t Know” or the sludgy droning of “Teeth” giving way to the graceful narrative of “Lille,” Hannigan’s singing emerges as the star – no small feat considering the remarkably tight arrangements, most notably in Tom Osander’s shaker-and-kit approach to percussion. Hannigan and company then shift into the quasi-stomp of “Keep It All” followed by a strings-and-xylophone cover of Bert Jansch’s “Courting Blues” in which Hannigan wails with a conviction other attempts at Jansch’s work have never even broached. That Hannigan and band can move so fluidly between tempos and evocations isn’t much of a big deal in and of itself, but becomes almost staggering in the context of these shifts all still being contained in the fairly limited realm of folk rock. Part of this may be due the excellent playing of the backing band, but just as much may be due to the arrangements (smartly) relying on violins, cello, trumpet, xylophone and standup bass to provide Hannigan’s foundation rather than the tried-and-true guitar-plus-vox formula. The whole thing results in music that feels mostly old and familiar but sounds entirely strange and somewhat new; all told, Sea Sew somehow manages to be revelatory without being terribly groundbreaking and forward-thinking by only looking back.